1696 Hampshire crosses the Atlantic - Check Mate! On October 1, 1696, four days after slipping into the Antilles Current Hampshire had reached the Florida Straits and the Gulf Stream. By October 15, the Hampshire had been at sea for 28 days sailing northward in the Gulf Stream and were being constantly nudged eastward in a long curving clockwise route along the eastern seaboard of the American Colonies. They were now ready for the long northeast run across the Atlantic to Plymouth, England. A fortnight later on November 1, after 45 days at sea Hampshire had sailed the Gulf Stream to The Grand Banks (southeast of Newfoundland) where the Labrador Current interacts dynamically with the Gulf Stream. In this case the North Atlantic Current had pulled them more toward the north . For the next week they would also feel the eddying effects of the Azores current . 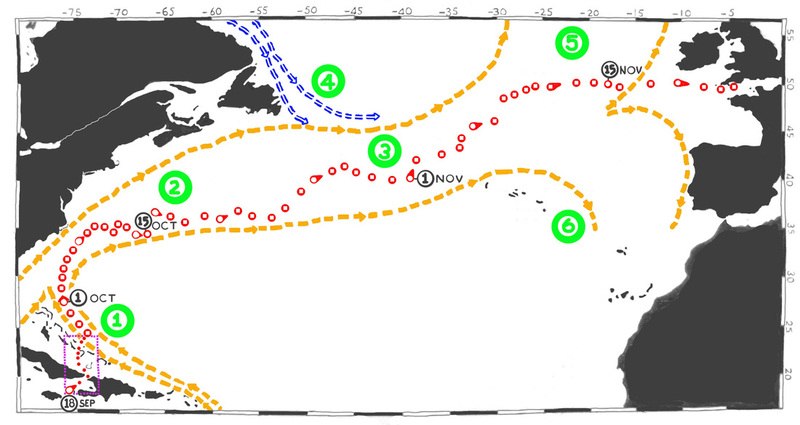 By Nov. 6th , their 50th day at sea, the Hampshire was being pushed northeast in the North Atlantic Drift. They started to sail a more easterly route. so that by Nov. 15th (Day 59) they were ready for the final leg to the English Channel. Four days later on Nov. 19th at “the 10th hour saw the light of Scilly in the N b E dust 4 L(eagues)” on the small archipelago of islands and islets lying 28 miles southwest off Lands End, Cornwall. Fletcher knew that winter gales could lash the islands at his time of the year. However, because of the mild effect of the North Atlantic Current frost or snow were almost non existent there! The next day at “the 4th hour” the Hampshire passed “the Lizard N b W, (at) 4 Leagues” off its port bow. This important landmark is a 14 mile by 14 mile peninsula known to all English mariners. The most southerly point of mainland England is near Lizard Point and all seaman knew that the hazardous coast and seas around the Lizard were referred to as the ‘Graveyard of Ships’ for a good reason. Fletcher had to be vigilant and a 4 Leagues buffer was a safe distance against disaster.